Zoysia Farm Nurseries’ Nutri-20 fertilizer helps you have a beautiful, lush green lawn. But it doesn’t stop there. It will help you grow plumper, tastier tomatoes, sweeter melons, bigger roses, and healthier shrubs. 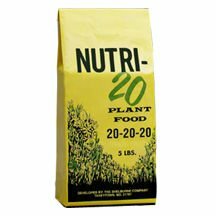 Nutri-20 is different than granular fertilizers, which simply sit on the surface, causing burns that would damage the plugs. Our fertilizer is water soluble, which helps release nutrients much faster. Since zoysia grass is thick and hearty, the water soluble nature of the Nutri-20 fertilizer allows for the nutrients to reach the roots, providing your grass plugs with vital food elements that help it grow. If you are looking to use Nutri-20 for your lawn, note that a 5 lb. bag will cover approximately 4,000 square feet of lawn. The tips below will help you apply Nutri-20 to your lawn, plants, and shrubs. 1. Put 1 cup of Nutri-20 into sprayer. 2. Fill to top of sprayer with water. 3. Shake well to dissolve Nutri-20. 4. Attach to hose, turn on water, and begin spraying. 5. Covers 350 square feet of lawn. 6. When sprayer is empty fertilizing is complete. First, set your dial to 8 ounces. Then follow the instructions below. 3. Shake will to dissolve Nutri-20. 6. When water in sprayer is clear fertilizing is complete. Use 2 teaspoons per gallon of water. 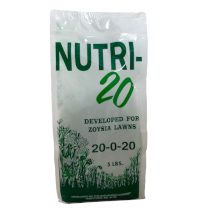 See additional information about Zoysia Farm Nurseries’ Nutri-20 fertilizer. Are you really mowing your lawn the right way? Most people aren’t exceptionally fond of this lawn maintenance task, but if you do it the right way, you can enjoy a nice lawn. 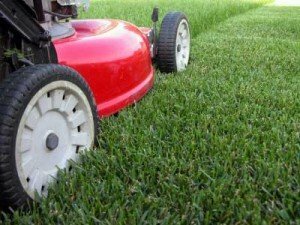 All About Lawns gives us a few mowing tips that can help to keep the quality of your grass looking great while still saving time. Cutting your grass to short can help destroy it by making it vulnerable to weeds and insects. You are going to want to keep your blade sharp, too. Dull blades can destroy the grass shaft. One rule of thumb: never cut more than 1/3 of the grass height. Spring is the time for most grass cutting, which would be about once a week, depending on your personal preferences. During warm weather, grass should be cut a few times a month. Don’t over water; it can help cut down on growth. This is a key time saver. Don’t waste time with bagging grass. Leaving the clippings on your lawn will help nutrition of your lawn. It can also help retain water so that you don’t have to spend as much time watering it. You could maintain your lawn using the tips we just gave you, or you could invest in zoysia. Grass maintenance for zoysia is pretty simple. You will spend less time mowing your lawn (about two-thirds less time, to be exact) because of the very nature of zoysia grass, although you do want to keep the general rule of thumb in mind. You won’t ever have to use fertilizers or pesticides, and you will rarely have to water. Once you have planted your zoysia lawn, you might be curious about how to care for it once it has become established. In this post, we will let you know what to do about fertilizing established grass plugs. Your zoysia lawn will be its most luxurious and healthy if it is fertilized once it is actively growing in the spring before the heat of summer. May through early June is ideal for most of the country. You should NOT use ordinary, granular fertilizers because they can burn or cause serious damage to your zoysia lawn. You must use a water-soluble fertilizer, like our Nutri-20, that has been specially formulated for use on turf grasses. Nutri-20 is great for other stuff, too, like shrubs or vegetables. When applying fertilizer, you should apply it with a hose-end sprayer, that supplies necessary water along with the fertilizer. Always be wary of directions, carefully following the recommendations, when applying fertilizer of any kind; you don’t want to overfeed your lawn, which may result in a chemical burn. In our last post, we let you know about some ways that a low maintenance lawn could help save you money while being environmentally friendly. Here are a few more ways that you can save a buck while helping to save the environment. Lawns need to be cut, which can create an entire set of environmental issues on its own. Lawn mowers can be damaging by emitting air and noise pollution. However, there are some ways to help solve this problem. Rechargeable electric mowers are definitely environmentally friendly (they are friendly to your wallet, too). These are good for lawns up to about ¾ of an acre. An area that is larger than that usually requires a gas powered tractor, which isn’t so friendly to the environment. Newer ones are more efficient and becoming less offensive, but may not be the ideal solution. 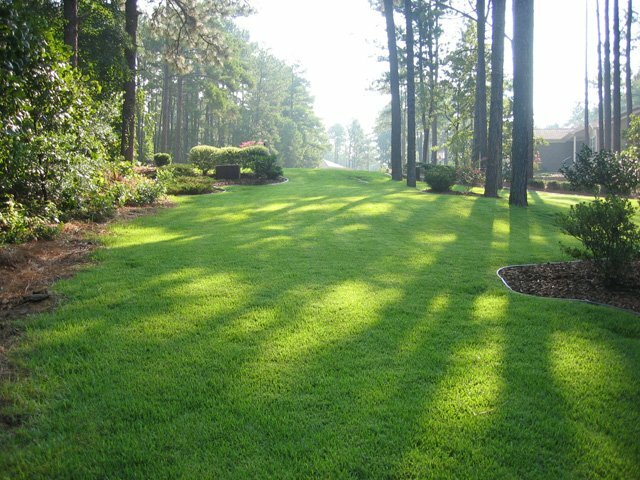 The simplest and best solution is to pick a slow growing grass, like zoysia, for your lawn. This will require less mowing, which will ultimately save you time and money while helping the environment by cutting down on emissions. You can even leave the clippings on the lawn to help turn old grass into organic material to keep moisture on your soil. 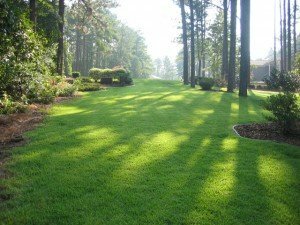 Another great aspect of low maintenance lawns like zoysia is that you don’t have to fertilize as often, if at all, which will ultimately mean slower growth and less cutting. It also means less potential for harsh chemicals to end up in our waterways. But if you do choose to fertilize, going organic is the best way to go about it. Having a sustainable lawn really means starting with choosing the right grass type suitable to your local conditions. It is key to understanding the characteristics of your grass so that you can know what you can do to help save time, money, and the environment. Putting in the right grass is the first step to a sustainable lawn.